Careless Android device owners will take heart in knowing Google has their back this holiday season and through the foreseeable future thanks to its new Find My iPhone-style app. 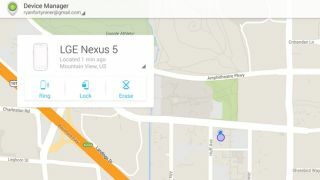 An official "Android Device Manager" app is finally available to download in the Google Play Store, making it easy to track down a lost phone or tablet, lock it or wipe it's data remotely. The same functionality came to Android devices in August, but it was a cumbersome browser-based solution that wouldn't help anyone in a panic. The messy setup forced users to visit a website with an extremely long URL and it didn't have the option to lock the phone or tablet at first. It was either "ring" or "erase everything" with no in-between locking measure. Today's update puts Google's Android Device Manager on par with Apple's well-serving security equivalent, Find My iPhone. Android owners will also want to keep their finger on the Google Play update trigger for Gmail 4.7. This latest version adds a vacation responder and the ability to send even more types of attachments. "If you forget to set a vacation responder as you scramble to pack for a flight, you're in luck since you can now create or update an auto responder message right in the Gmail app on Android," announced Google on its Gmail Google+ page. New attachments that can be sent from a phone or tablet include documents, PDFs and zip files. Previously, Android owners were limited to including photos and videos. Rounding out today's useful Gmail for Android enhancements is the ability to print hard copies of emails if you're one of the lucky ones with a device is running Android 4.4 KitKat or, in very select cases, Android 4.4.2. Check out: The specs on Dell's Chromebook 11 laptop.